This is a real “Mexican Fiesta”! I was inspired today. We just finished eating these delicious tacos and my husband and I are still sipping on the hibiscus lemon cocktails. Happy Friday…that’s for sure! Every three weeks I take the time to go out and have what I call “beautifying time”. My husband loves it! I don’t think he loves it because I come back with new eye brows, hair and nails done but more than anything because I stopped at the store and buy good ingredients to create good food! And we really make it a “fiesta”…lol! A man will always be happy if he has good food on front of him;) On my way back from the salon I thought about making a shrimp dish. I stopped at a Mexican store and got some corn tortillas, fresh cilantro, chile chipotles and dried sweet hibiscus flower. 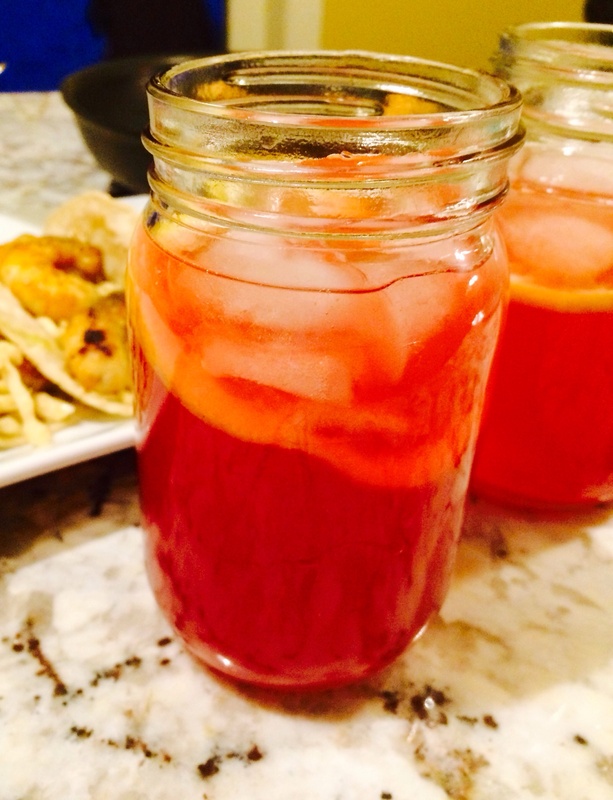 Have you heard of hibiscus flower? It is a flower that grows in tropical weathers like Mexico, Latin America and North Africa. Used in many refreshing teas now like the Starbucks refreshers or Panera bread teas. Mexicans use it a lot on their fresh waters or “Aguas frescas”. They call it “Agua de Jamaica” or Jamaica water. It is simply an infusion of this flower in water with other spices and lots of sugar since it has a tart flavor. I can tell you that if you are around a Mexican grocery store you can get a half pound bag for few dollars and it will last you a long time. If you don’t know where to get it go to www.mountainroseherbs.com and you will find it there for less than $5 a bag. But going back to the Mexican fiesta…I thought this water will be awesome in a cocktail so I gave it a try. 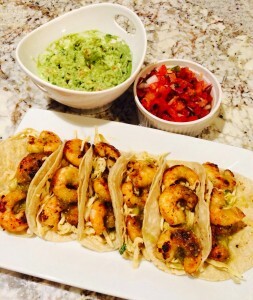 With my shrimp I wanted spicy and smokey chipotle tacos so I used a dry chipotle rub to season. I am sharing the dry rub below. You can also buy a chipotle rub at the store but if you have the majority of the seasoning and dry herbs handy why not make it yourself, right? And if you make enough you can save it in a small container for another time. I also added some cabbage slaw. I made the slaw vinaigrette out of chipotle purée, white vinegar and sour cream. I love cabbage on seafood tacos because it gives them a great crunchy texture. Very important that the shrimp doesn’t get over cooked. This is the star of the dish and it has to shine! Once you put it in the sautéed pan and it gets pink on one side you can flip it until they get pink on the other side and that’s it. Otherwise it gets rubbery. If you want to use fish instead I will recommend a panko breading before sautéed. Apply the rub on the shrimp about 2 or 3 tbsp for the amount of recipe. In a hot sautée pan with 1 tbsp of olive oil cook the chipotle shrimp. About 3 minutes. Make sure this will be the last thing you do before serving so everything else should be prepared. Mix the sour cream and chipotle sauce with vinegar and salt, pepper and cilantro until well combined. Add the cabbage and mix. Corn tortillas: you have to warm them up. I put my flat top (where I usually make pancakes) to warm them up on the stove. Once hot, I place the tortillas on and flip them around and they are ready. To serve: place the tortilla on a plate, add 2 tbsp of slaw and 3 or 4 shrimps in each taco. Place a thin slice of avocado on top. Bring water to boil and add the sugar. Stir until it dissolves about one minute. Remove from heat and add the dried hibiscus and spices. Let it infuse for an hour. Strain and chill. Rediculously tasty! Great dinner Baby!